Ever since the dawn of mankind, people have invented different ways of staying dry in the rain and snow. 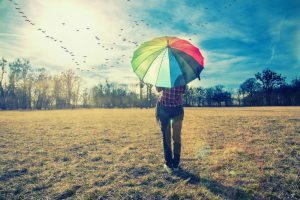 Umbrellas as we know them today have been around for centuries, however some exciting developments have occurred in recent times... the introduction and increasing popularity of inverted umbrellas. We've picked out 5 Top Picks to save you hours of research! 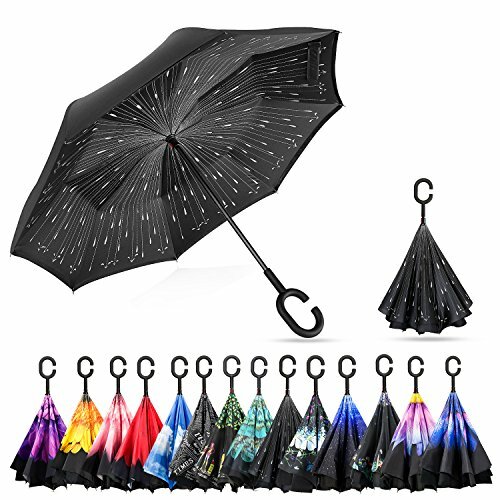 This type of umbrella literally turns inside out when being opened or closed. When the umbrella is being closed, the top outer canopy goes inside the umbrella and the underside of the canopy becomes the outside! So not only does the umbrella keep you dry in the rain, it keeps the rain away from you when you go inside, how clever is that?! You don’t have to splash water all over the floors of your home or the interior of your car. 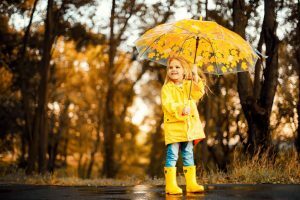 At The London Umbrella Seller, our years of experience mean we understand exactly what's needed to construct a reliable and strong umbrella. Having researched hundreds of models, we’ve rounded up five of the best ones out there, these will make your decision so much easier! 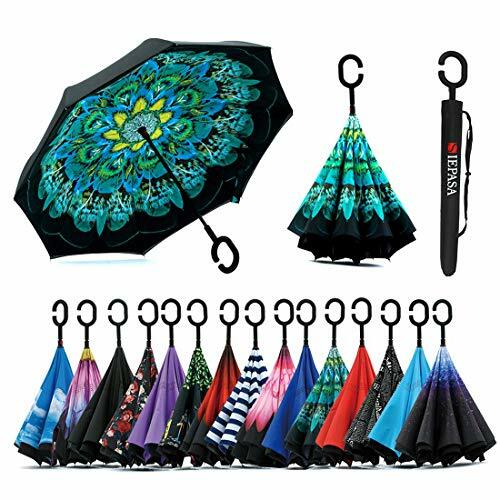 Like all its rivals on the market, the Bagail reverse folding umbrella is designed so that it folds in a reverse manner, and by doing so it keeps you from getting wet the very instant you open it. This is one of, if not the best inverted umbrella out there. It is a bestseller everywhere. This is one of the largest inverted umbrellas we know of, as it has a diameter of 46 inches when fully opened. So, if you’re into taking your soulmate for a romantic walk in the rain, you could do just that, as this umbrella is HUGE. 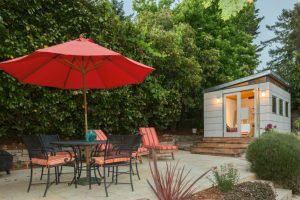 When you open it as you’re getting out of your car or your home, you will get cover instantly, the inside out design means the canopy deploys super-quick. Also, when you get back home or into your car, it can stand on its own and without the need for a dry. 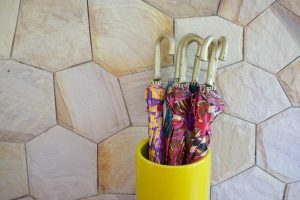 The reverse design means that it keeps all the raindrops inside and doesn’t make a mess of your floor or car interior. Its sturdy construction consists of a durable metal frame and two layers of durable pongee cloth. In practice, it is very resistant to strong gusts of wind and it won’t collapse when exposed to such harsh weather conditions. On top of all this, it provides you with UV protection, so you can use it in the sun as well. 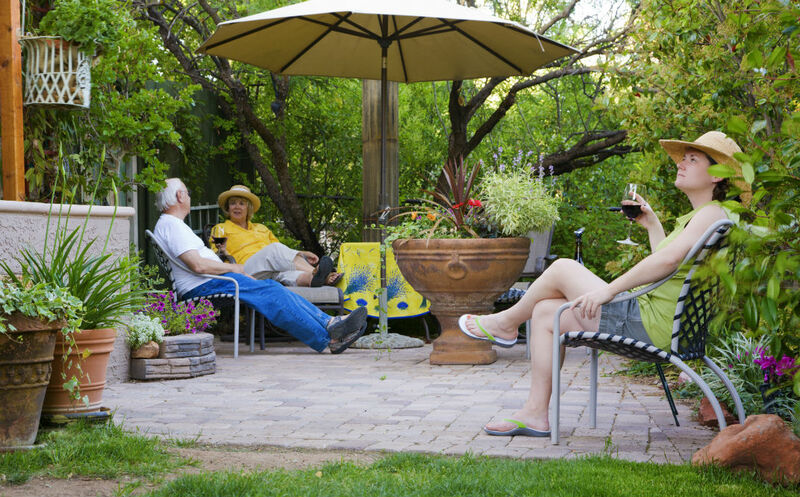 The C-shaped handle is a convenient feature, as you can hold the umbrella while keeping both your hands free. It's so clever! Here we have yet another contender from our selection of best inverted umbrellas, and as is the case with the others, the OneRain has its own little twist to the revolutionary idea. Like the others, it folds in a reverse manner and by doing so it makes it easier for you to keep dry when you’re exiting your car or your home. It is designed so that it can stand on its own, so you can put it anywhere when you get back home and it will keep all the collected water inside, without making a wet mess of your floors. As its name implies, it comes with a clever feature called Fast Auto Open. You simply need to click a button on the handle and it opens in an instant. The button only works one way, so when you need to fold it back you do so manually. Its double layer canopy is spread over a sturdy metal frame. The high-quality materials and sturdy build make the OneRain more wind resistant than many of its rivals. The C-shaped handle makes it easy to hold the umbrella without using your hands, which would be great for young moms with toddlers or serious shoppers with bags in each hand! While it comes with a neat carrying bag, it suffers from a rather modest choice of colors and patterns. Without further ado, the Dryzle inverted umbrella is probably our favorite of the bunch. It checks all the right boxes; it’s well-made, and it comes at a price that most people can afford. So what’s it all about? Yes, you’ve guessed it, like the others included here, this umbrella opens in a reverse manner and keeps you from getting wet the very instant you open it. This is so that you can get out of your car much easier. Also, it can stand all by itself when you don’t use it and it does so while keeping all the collected raindrops inside until it dries. As with our previous contender, it has an auto-open feature, simply fold it down manually when it stops raining. The construction is sturdy so it can withstand heavy gusts of wind, and of course it comes with a C-shaped handle which keeps your hands free while you’re using it. This is an excellent feature for when you need both hands free on the go. It goes without saying that the canopy provides UV protection, as well. 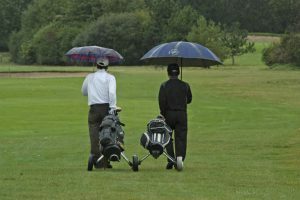 The umbrella comes with a carrying bag, so you can carry it on your shoulder when it’s not rainy. Last but not least it, comes in a very large number of colors and designs, so no matter your style you’ll find one that suits your preferences. 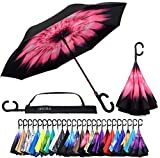 If you want to purchase an inverted umbrella, but you don’t want to break the bank in doing so, this is probably the best choice for you. 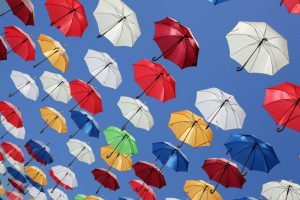 Even though it is quite moderately priced when compared to other products on our list of best inverted umbrellas, the Elover still ticks all the right boxes. It is a reverse folding umbrella, designed so that it can stand on its own, with all the water collected inside from the downpour. Its frame is made from stainless steel and fiberglass, while the C-shaped handle is made from carbon fiber. It has a button for automatic opening, and is closed manually. The canopy provides UV protection, and wind protection as well. There are a large number of color and pattern options to choose from. 【Inverted Reverse Umbrella】 This umbrella is a necessary tool for raining days. Umbrella Size: 32in * 8 Ribs. Package comes with a carry bag. 【C Hook Umbrella】 Unique C shaped handle free your hands to hold a baby or use a mobile phone or carrying things if needed. 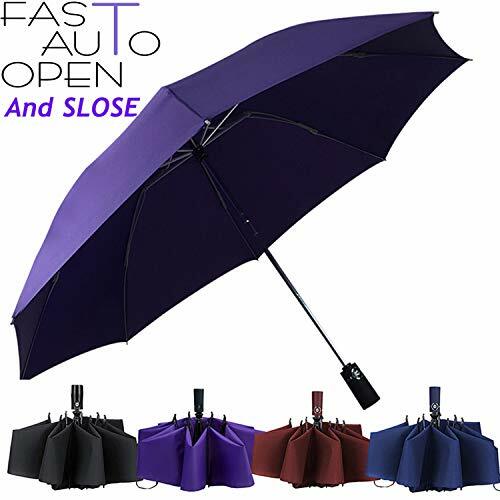 【Inside Out Umbrella】 One button to easily open this inverted umbrella, and not get yourself wet when getting and out of the car. When close it, the water will stay inside of the umbrella and doesn't get the floor wet. 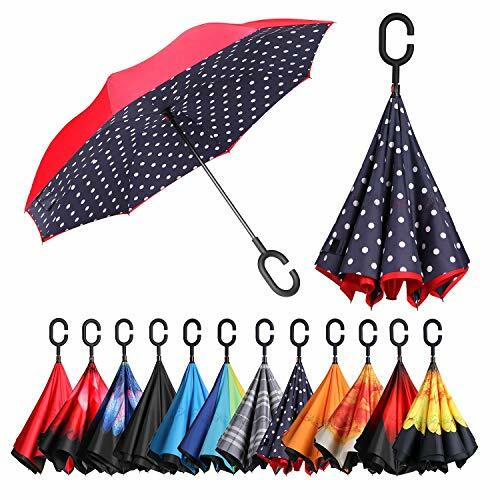 【Durably Windproof】 The double layer inverted umbrella made of pongee cloth,durable black electric ribs and double layer ribs make the cars umbrella more sturdy, enhance its windproof effect. Last but not least, here we have another inverted umbrella with the revolutionary design, and it won't break the bank. It's a serious contender and will keep you dry the very instant that you open it when the heavens open. The Spar.Saa inverted umbrella can also stand on its own and prevent your floors or car interior from getting wet. 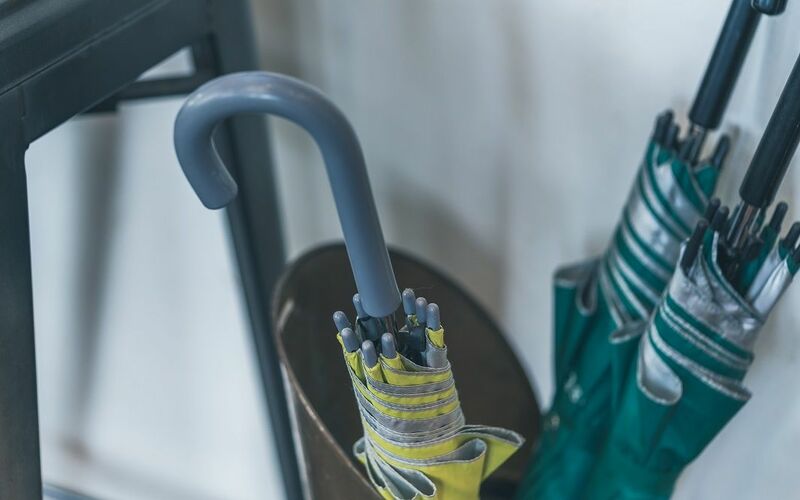 The C-shaped handle makes it easier to carry the umbrella, leaving you with the use of both your hands, perhaps for sending a text message or checking your email. 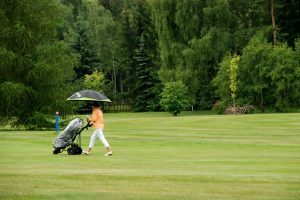 The heavy duty dual layer canopy is wind resistant and also provides UV protection, so the umbrella can be used as an extra-large parasol on sunny days as well. There is a huge range of different color and pattern combos to choose from. 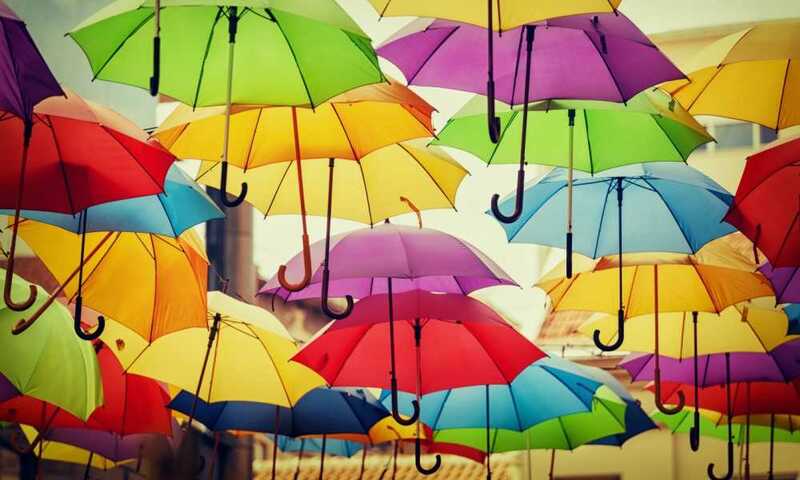 The market for inverted umbrellas is a rather booming one, as there are numerous brands and models to choose from. 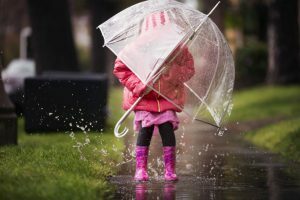 Hopefully, this article has been helpful in explaining what these products are all about and their main benefits over ordinary umbrellas. It is always hard to decide on our top pick, however if we really had to pick one from our list to be the best inverted umbrella, we would probably go for the Dryzle. It’s modestly priced and comes with an auto-open function and a carrying bag, while its palette of available colors and patterns makes it easy to fit any style or outfit.